You know those moments… you get a critical email and you fire off a response and hit send. Or the car in front of you doesn’t go immediately when the light turns green and you lay on the horn. Maybe your child forgets their homework again and you explode. Ah… stress! I have a theory: when we’re stressed, we don’t recognize how we’re coming across to others. We often lack self-awareness. With the holiday season right around the corner, and all that added stress those holidays bring, it feels like a good time to talk about self-awareness and taking our stress temperature. Wouldn’t that be a great prayer to pray as we head into November and December? Think about it: your calendar is going to fill up, expectations are going to pile up, and the pressure is going to build. Learning to take your stress temperature might help you avoid unnecessary conflicts and enjoy more fulfilling relationships. When I am stressed out, how do I respond to others? Some people withdraw and get quiet; others snap or use a sharp tone. Others talk fast or move so quickly through the room that they walk past others completely unaware. If you’re not sure how you respond to others when stressed, ask those closest to you. When you become aware, you can ask the Holy Spirit to change you and clothe you with gentleness so that those you care about feel loved. When was the last time I got a good night’s sleep (like 7-8 hours) or felt truly rested? We need sleep in order to function at our best. When we’re exhausted, it’s hard to listen to others and have the emotional energy to hear what’s on their heart. When we’re exhausted, we don’t’ think clearly, and we can’t solve problems effectively. When we’re stressed, often the first thing to go is sleep. We may go to bed, but we toss and turn, unable to sink into deep restorative sleep. So a good way to figure out how stressed you are is to evaluate your rest. What worries might prevent me from really listening and focusing on others? You might need to box up your worries before you go to an event so that you can focus on others. One way to do this is to keep a prayer jar. 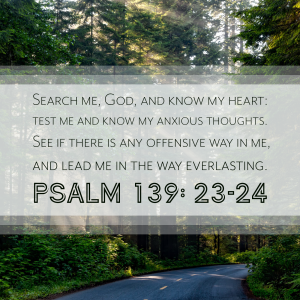 When worries overwhelm, write out a quick pray stating your worry and give it to the Lord. Put it in the jar as a symbol of trusting God with your worry. Then praise God that you can let it go. He’s got it, and while He’s taking care of your worries you can listen well to someone else’s worries. How do I want others to remember me? How you want to be remembered is how you must behave now. In other words, if you want others to remember you as cranky, then be cranky now. If you want to be remembered as joyful, then you need to be joyful now. When I’m in a high stress season, I ask myself this question to keep a check on how I’m coming across to others. I’m guessing you, like me, want to invest deeply in your relationships. I’m guessing you want your family and friends to feel loved by you, and that means you might need to take your stress temperature so that you can grow in self-awareness. Loved this, Becky. I’ve been thinking a lot about the upcoming holiday season, so your message here is so timely and helpful!